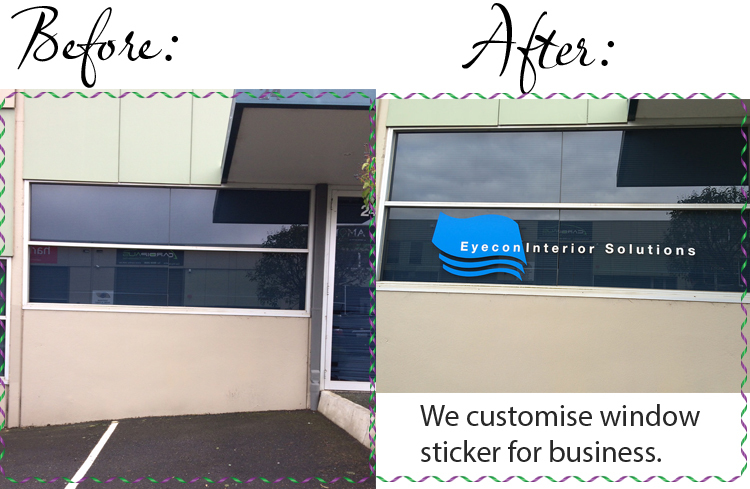 We customise make window stickers, shop signages for business. Transform your empty window into an attractive advertising space that enhances your brand or product with HM vinyl cut window decals. It can heighten your business and product appearance to potential customers with news of promotions, sales, store hours, new inventory, your company logo. Window decals are a crucial driving force for attracting new customers into retail or store front businesses. We customise window sticker, shop signages, light box, vinyl sticker for business or home, contact us to find out more we can offer. Congratulate HM Wall Decal team just finished another interior renovations project in Hight St, Armadale, Victoria for Fusion House Restaurant. Looking for help to make over your business space or going to open a new business ? Below images are from our customers, we greatly appreciate it. Big thank you to Helen and Carol. Do you have photos that you want to share with others ? Please sent them to us and we will upload it here. We'll have a competition and everyone can vote for their favourite. Thank you Helen for sharing these photos with us. They look beautiful. Job well done and they look gr8. What a master piece work she had done ! It just look beautiful and we all love it. Carol use 5 different HM house rule wall decal to make up this master piece in total length 5.5 metre . Well done Carol and big thank you.